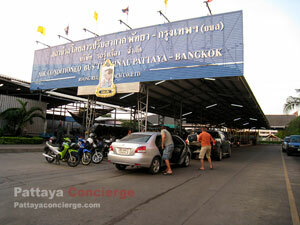 Transport and Bus Services from Pattaya to Bangkok or Suvarnabhumi Airport. As you may know there are several ways for going from Bangkok to Pattaya. In the case of going from Pattaya to Bangkok , there are several options available for visitors too. However, in general, the most popular one is to go to Bangkok by bus. Although there are 2 options, the First class bus, and the second class bus, the recommended choice is the first class one because it is only a bit more expensive, the ticket is 124 Bath (approximately 100 Bath for the 2nd class), but it is much faster for arriving in Bangkok as the bus does not stop over many places. Additionally, to go to Bangkok by bus, visitors will have to 3 choices for the arriving places – Eastern Bus Station (Ekkamai Station), Mochit 2, and Southern Bus Terminal (Sai Tai). Note that Ekkamai Station is very near BTS (Sky Train), so if visitors want to travel by BTS, Ekkamai option would be more suitable and The bus in general only stop over at 4 major places before ariving in Ekamai - HomePro (Bangplee), Pedestrian Flyover opposite Central Bangna, Udomsuk BTS Station and On-nuch BTS Station. 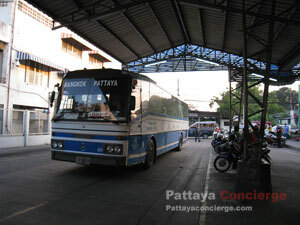 Visitors can find the first class bus at Roong Reuang Bus terminal (Pattaya Bus Terminal)l (North Pattaya). Although Roong Reuang Bus terminal is a private company, it is so popular that many people think it is public transport. Note that there is a bus departing approximately every an hour. Similar to going to Bangkok, visitors can find a first class bus from Pattaya to Suvarnabhumi Airport at Roong Reuang Bus terminal. The bus ticket price is approximately 110 Bath as to go to Bangkok. Note that there is a bus departing approximately every an hour. Metered Taxis would be the most convenient option for visitors to go to either Bangkok or Suvarnabhumi Airport. It will also be the most suitable one, if visitors have to carry a lot of things or a large or two laggages because it would be a bit difficult to take them to Pattaya Bus terminal, where as taxi can pick any visitors up at the hotel. However, visitors will need to pay more for better service as well (approximately 1,000 Baht).